The TOEIC test is a Paper & Pencil test consisting of 2 sections - Listening (45 mins) and Reading (75 mins). The Test takes 2 hours to complete and includes 200 Multiple Choice Questions. The test is an English proficiency test and can be applied in a variety of ways. In English speaking countries it is commonly used by language schools, and can be used by Colleges and Universities to check English levels of graduating students. In non-English speaking countries it is most commonly used by companies and Universities who wish to ensure their applicants or graduates will be able to communicate internationally. ETS's TOEIC program is Internationally recognised - it is the most widely used General Business English language Exam and is taken more than 7 million times each year around the world. Test takers will receive a score report as part of their assessment, and those tested in public centres can have their scores verified by ETS worldwide. 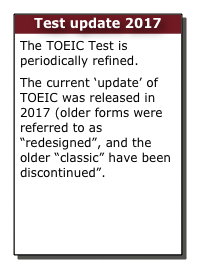 •The TOEIC User Guide contains information on test content and format, administration, scoring & results, score use, policies and guidelines, statistical characteristics, and research.